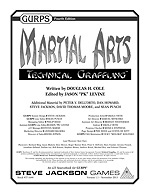 Over on the SJG forums, there’s been a short dialog about a particular grappling move shown in a Marine Corps instruction manual. While I could (and have) opined on what I think that the move is, I wanted to make two points. First, GURPS provides something like five different ways to take someone down with grappling. Second, and most importantly, don’t sweat it. While GURPS does provide for mechanical support for a bunch of different ways to do what you want, in a pinch, take a look at the similarities, not the differences. First, lets look at the five options I listed in my Takedown Table on p. 19 of GURPS Technical Grappling (gratuitous plug). Of these, three require a grapple, and one requires both a grapple and a lock. Two don’t require it, and in fact, both start and end without one by default in the rules from Martial Arts and the Basic Set. As you might imagine, a defensive judo throw starts when a parry ends. 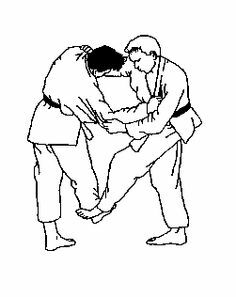 In particular, if you do a successful Judo Parry, you can (no surprise) follow that on your turn with a Judo Throw. This is resolved as an attack; your foe gets to defend – some degree of contact is assumed from the Parry. OK, look at a Sweep, now. No contact is assumed, so you have to make it. This is an attack roll, as are all attempts to touch your foe, with or without injury. Since it’s treated as a strike and is often used with a weapon, this doesn’t get halving of penalties for location. OK, you’ve touched your foe, now to take him off balance, you roll a Quick Contest. Win and the guy goes down, and you stay standing. The Quick Contest is a stand-in for a damage roll, in a way. The other three are basically variations on a theme. Grab the guy by making an attack, or in the case of a Throw from a Lock, first grab him, then put him in a Lock – that’s two attacks required, but the benefit of all that is you get to do swing damage. To do the throw or takedown, you then roll . . . a quick contest. Again, the Quick Contest is the effect roll, and if you win it, then again, you dump the guy. Sure, there are special rules, but basically, you’re dealing with DX, ST, or skill vs your foe’s DX, ST, or Skill, including Breakfall if you have it. While it’s certainly possible to have mechanical support for everything in GURPS, that’s not always desirable, and if you’re looking at Roll and Shout as a philosophy, you can do it. When it comes time to get the guy down, you’re rolling a Quick Contest. If you’ve got an actual grapple, you can keep it. If you don’t, you can’t. If you win your QC, either he goes down, or he get injured. As I read Fate, I think what I’d wind up ruling here – and true system masters can correct me – is that the grapple or set up is Creating an Advantage. If you’re using an Aspect or Stunt with a wrestling component to it, you could follow a successful defense based on that Aspect (say Judo Master, or Scrapper, or Warrior of Many Facets) with an attempt to Create an Advantage, perhaps at a bonus. Heck, the ability to follow a defense with a boosted Create an Advantage would be a nice consequence of a highly successful defense. The takedown itself would also be Create an Advantage (giving the aspect Thrown to Ground or something), while an attempt to injure would be an Attack. Without taking away from the thread that started me thinking, remember that all the ways to take someone down in GURPS have more in common than they have differences. If you’re in the mood to roll and shout, keep those commonalities in mind, and whatever ruling you wing at the time is unlikely to be that different than what Sean, Peter, or I wrote in our respective books! Yeah, I probably am sweating small stuff way more than is worth while. Good point!